Thanks for stopping by today as we explore some unique Disney Trivia! I always enjoy reading the trivia that my friends Heidi from Heidi’s Head, Jenn from Disney Babies Blog, and Jodi from Magical Mouse Schoolhouse have to share, as well as the ones that you all add to our group! It makes for a fun time for everyone! To read the rest of the entries, just click on them below, and thanks for stopping by! 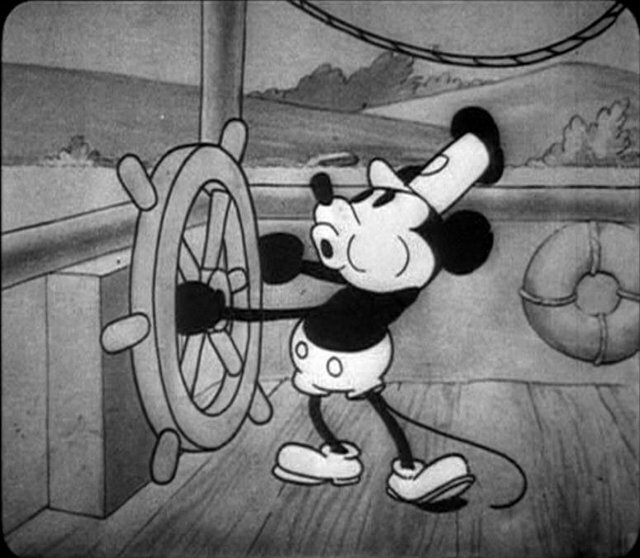 Whatever you do, make sure to make it a Disney Day, and don’t forget to enter to win a $400 or $200 Disney Gift Card! Season 3 of Once Upon a Time starts tonight! 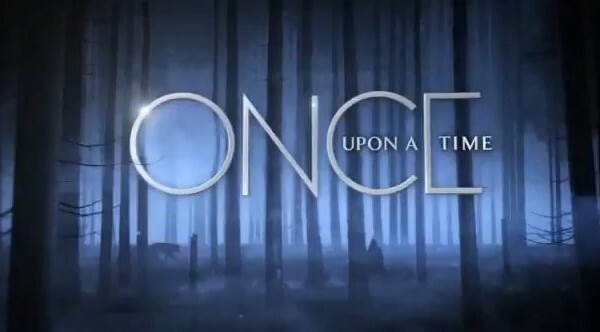 Season 3 of Once Upon a Time starts tonight! Get ready to stop what you are doing and watch it! There’s been so much that has gone on — and honestly, I fell out of it during Season 2, so I’m totally lost about what is going on right now — but I’m excited to see what I’ve been missing! From what I’ve seen on Facebook, Season 3 opens with six of the characters working together to save Henry. Can they do it? We’ll have to find out, won’t we? Until tonight, though, here’s the sneak peak that you can watch to get ready for tonight’s show! So tell me, do you watch Once Upon a Time? Is it something that you look forward to, and are now glad it’s back on? Have you been chomping at the bit for new episodes to come on? Well, your time is almost up…your wait is almost over…in just a few hours, Once Upon a Time will be back with a brand new episode. Tell me, what do you think will happen? Will they save Henry? What will ultimately happen to Rumpelstiltskin? Why don’t you tell us in the comments below, and thanks for stopping by today! Mickey’s Backyard BBQ is one of the Walt Disney World Dinner Shows that you can see while on vacation. Located at Fort Wilderness Campgrounds, the pavilion where the BBQ is held is not far from the location for the Hoop Dee Doo Review. We took Sophie and my niece Stephanie to the Backyard BBQ for Sophie’s 9th birthday when we were at Disney World celebrating. We were on the Disney Dining Plan for this visit, and Mickey’s Backyard BBQ counts as 2 Dining credits and also required us to guarantee it with a credit card. This requirment isn’t as big a deal now, as Disney has started requiring a credit card guarantee on many of their table service restaurants. The setting is rustic, and while this isn’t for everyone, it was great for me. Sophie had some really great quality time with Mickey and Minnie, as well as Chip, Dale, and Goofy. The stage show with all of it’s country influence was great. There was a lot of energy involved with everything here, and we enjoyed it quite a bit. In fact, I enjoyed our experience quite a bit. There were only two things that I think should be changed, but I will understand if they aren’t. The first is the 2 TS credits required. I love the show, and all of that, but I just didn’t feel like it was worth 2 TS credits. The other thing that I wasn’t crazy about was the food. The big buffet was BBQ food, which wasn’t a problem; it’s what you expect. On tap were burgers, hot dogs, ribs, chicken, and all the fixings. The problem I had with the food was the temperature. I know that this is something that is hard to control in what is basically a covered outdoor pavilion, and is also something that can be totally different the next time we eat there. I think if I were making the decision on how to conquer the temperature problem of the food, I would make smaller quantity, and replace it more often. For example, instead of making 100 burgers and replacing them every 20 minutes, make 50 burgers and replace them every 10, or something along that nature. However, all in all, I really enjoyed the BBQ, and would consider it again. If you decide on eating at the Backyard BBQ, I highly recommend that you give yourself plenty of time to get to the pavilion. We elected to drive to Fort Wilderness, then we parked, but then we had to wait on the bus to take us through the campground to where the pavilion was. All in all, I think it took at least an hour to get from our hotel at Port Orleans French Quarter to dinner. One last thing that I’ll mention was that all the people that were celebrating something, whether it be a birthday, anniversary, or other special occasion, you can write down the name of the person celebrating, and they will announce it as part of the show. So if you are celebrating, this is one of the places you can go that you can get your celebration announced. 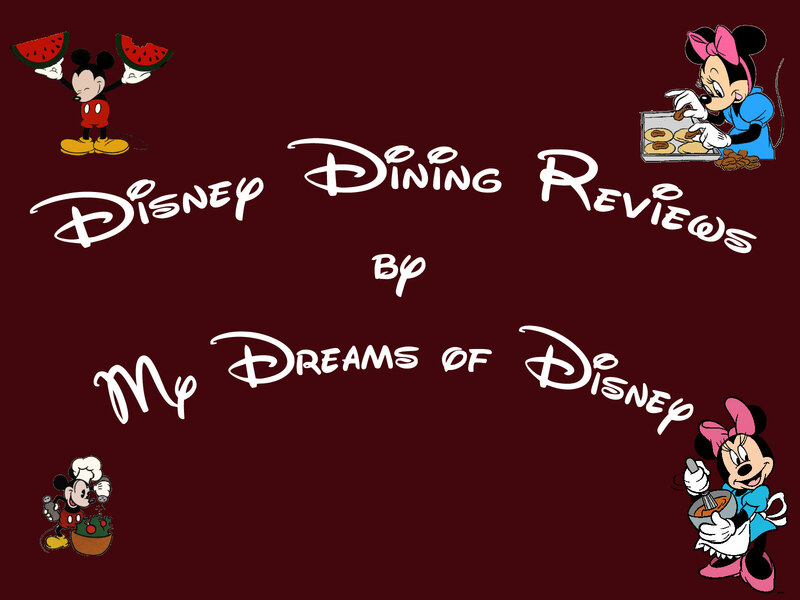 I hope you enjoyed the review, and that it helps you to decide whether or not to make a reservation at Mickey’s Backyard BBQ! If it doesn’t, maybe these pictures will! 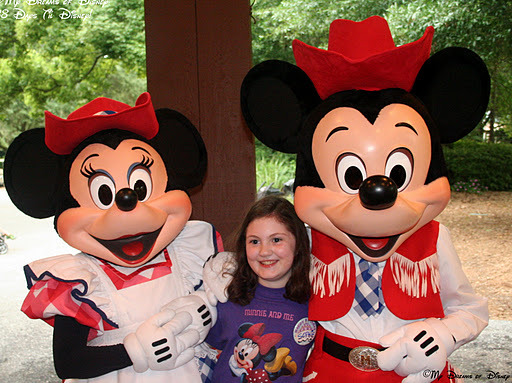 Sophie (with her self-created Minnie shirt) with Minnie and Mickey! Sophie loves corn on the cob! 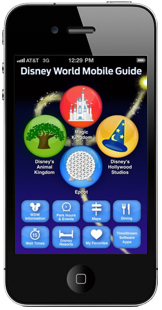 Not even close to Wordless Wednesday – Disney Storytelling! You know you’ve done it. You’ve been standing in line for an attraction like Splash Mountain at the Magic Kingdom for 45 minutes and you’ve thought to yourself, “Wouldn’t it be great if I had the entire ride all to myself? I could walk right through this line, hop onto the first ride vehicle and be the only person on the ride.” We’ve all done it! Years ago, I had the good fortune to work with the folks at Walt Disney World Merchandise doing photography for the screen savers they sold in the parks and on the Disney Cruise Line. In fact, if you bought any of these Disney screen savers, I was the person who took the photos found in each one. As part of the photography process, Walt Disney World Merchandise would arrange for me to have access to the parks first thing in the morning, well before the parks opened to guests. While there were no guests about, a small number of maintenance personnel were busy finishing a night of cleaning the parks and making sure everything was in working order and ready to create another day of magical memories. As a result, I spent much of my time moving about the parks taking photos while music was playing, train whistles sounded and the smell of baked goods filled the air…but nobody was around. To be able to experience them all to myself while I was “working” was a truly unique and enjoyable experience. The feeling of walking through the Magic Kingdom and having it all to yourself in the cool air and morning light is simply magical. Everything is sparkling clean and each path before you is unobstructed to any destination. I always enjoyed how most everyplace I went was open, yet vacant, as Cast Members were busy behind the scenes getting things ready. Imagine every store you walk into is welcoming, yet nobody is there, restaurants are perfectly still and you can see all the way across Frontierland and not see a single person. I always wanted to sit down and take it all in, but I had to keep moving and taking photos, as I had only a couple of hours with which to work. One of my favorite memories was walking through the entire queue at Splash Mountain with not a soul around. I stepped into the queue and continued without slowing my pace and approached the loading area where I found a couple of Cast Members preparing the log vehicles for the day. I explained that I was “working” and asked if I could sit in the front seat of one of the logs and ride the attraction to take some photos. They replied in true Disney fashion with a genuine “Sure!”, and with that I boarded the first log of the day and had the entire attraction to myself! Walking into the Magic Kingdom mid-day is always a special experience, but before-hours is something else. By early morning, the hard working maintenance staff has all of the Magic Kingdom sparkling clean and ready for guests. As a result, I found myself on more than one occasion walking down the middle of Main Street, U.S.A. towards Cinderella Castle all by myself with not a soul in sight while all the lights on the building facades were still aglow from the evening before and one of my favorite Disney songs, “Flitterin’”, filled the air. The task before me? Make sure I photograph the Partners statue with Cinderella Castle in the background in the early morning light before moving on to other areas in the park. It was a tough job, but someone had to do it. Epcot at 6:00 a.m. is an altogether different experience from that of 11:00 a.m. when it opens to guests. The air is cool, the shadows are soft in the early morning light and the lifting fog slowly reveals the pavilions on distant shores. However, with a circumference of 1.25 miles, it can be a lot of ground to cover when photographing all 11 pavilions before they open to guests. To photograph as much as I could, I had to move very quickly from shot to shot and pavilion to pavilion, but two pavilions tempted me to stay longer than I should; China and Japan. One of my favorite moments photographing Epcot was stepping from the clearly defined technology, music and hard edges of Future World East into the calm and serene landscape of China. Unlike Japan, which uses moving water in its landscaping, China uses still water, and in the early morning light, China presents radiant colors, ancient architecture and serene pools filled with blooming white water lilies. Since I had it to myself, I always made sure to linger a moment at the China pavilion to enjoy the beauty and art of this ancient culture. Later, while photographing Japan on a foggy morning, I was struck by how the morning fog brings an entirely different experience to the pavilion. With the torri gate in the lagoon at your back and all the other pavilions obscured by the fog, it really feels as if you’re in Japan. With nobody else around, there aren’t any elements which break that sense. Even seeing a single Cast Member with a name tag can make it clear you’re at Epcot, so having the pavilion all to myself allowed me to transport to Japan in the way Disney Imagineers intended. These are but a few of my favorite Walt Disney World before-hour memories…which I can share. There are certainly others. Backstage was always interesting, and being questioned by Disney Security on a regular basis always made me feel like I was some kid in trouble. (That incident on the Disneyland Skyway when I was 12 didn’t help.) I was also in the right place at the right time to shoot an image on the fly of a comical scene in Disneyland unlike any I’ve ever seen. I’d include it with this article, but Walt Disney wouldn’t have wanted it published, so it will remain right where it is. 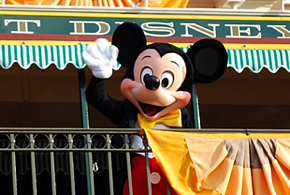 Lastly, thank you to Mickey Mouse for allowing me to take your first photo of the day…before the gates opened. I do have a big praise today to share with you! Today (Saturday, September 28), a big group of family and friends came out to celebrate the 60th Wedding Anniversary of Ervin and Lois Millwood, the wonderful parents of my Sister-in-Christ Monica. Mr. & Mrs. Millwood are salt of the earth people, people that would absolutely give you the shirt off their back, people that don’t lecture, they teach, people that, no matter what, you know you will always get a warm smile, a hug, and a handshake. Ervin and Lois remind me in so many ways of MY Grandpa and Grandma — and I can think of no higher praise than that — except for this. Lois and Ervin Millwood are Christians, they are saved, they KNOW Jesus — and Jesus knows them. It was a wonderful day celebrating their life together, one that we look forward to seeing day and day again for many more years to come. Chelsea starts us off here today. Here is what she wrote and her update that follows:Praying for all these request! Praising our Lord for all the praises! If I could ask a prayer for my cousin she might have torn her meniscus and she can’t walk…She has less than 4 weeks till she is supposed to get married. Thanks! Mike you are amazing and I really appreciate the prayers for my cousin! She has her MRI yesterday and should get the results over the next few days..I’m praying for Kourtney, Frances, and Becca is one of my friends as well I will be continuing my prayers for her family. God Bless them and You! I never ask for thoughts and prayers, but we need them today! Please send my family as many as you can.Lord, please be with Kourtney and her family today as they battle the demons they face today. Please grant them Your Peace and comfort and strength in the days ahead. It is in the name of Your Son Jesus that we pray with thanksgiving. Amen. She told us later that her nephew needed heart surgery, just days after being born. He has had his first surgery, and will likely need more, but we’ll take it one day at a time! Please pray for my friend Frances as well. Here is what she posted on Facebook:I cautiously opened a can of whoop a$$ on the facility that my Aunt is in. Please pray for her and my family as we gather the resources that we need to get her home within the next month.Lord, please be with your servant Frances and she and her family work towards getting her Aunt out of the facility that she is in. Please take care of them all so that her Aunt can be in a more loving environment, and so that she can face her remaining years surrounded with the love that You and her family provide. It is in the name of Your Son Jesus that we pray with thanksgiving. Amen. A powerful word on the faith that my friend Becca and her family have. Here is what she wrote on Facebook earlier:Today I am grateful for my testimony of our Heavenly Father’s plan for us. While death may be the end of our time together on this earth, we can be with our families forever. Mike’s family could use prayers for comfort and peace at this time. His uncle is expected to return to our Father in the next few days. We know we will see him again, but this us still a very hard time for his family.UPDATE: We learned that Walter, the uncle referenced by Becca, passed away shortly after her statement. Please surround Becca’s family with love and prayers, please pray for God’s Peace, Comfort, and Strength to descend on them in their days of grief. The comfort that they take in knowing that Walter is now with Jesus is wonderful, but the grief and sadness they feel without him there is still hard on them. Thank you everyone for your prayers for Becca and her family. Please pray for my friend Jennifer and her family as they deal with the loss of their Granny. Here is what Jennifer wrote — it’s beautiful in the memories that she invokes and you feel as if you were right there with Jennifer as you read her memories:We lost my sweet Granny last night, and the world lost one of the strongest, most beautiful people. One of my first memories is of laying my head in her lap while she ran one hand through my hair and I rubbed her other hand; I was always amazed at how soft her skin was, and she was amazed I thought so after she had worked every minute of every day for her entire life with those hands. She fed me the best food, took care of me (especially in those first three years before my Dad came into the picture), slept next to me on the pull-out sofa for slumber parties, taught me how to sew a button and make jello, and joked with me about our funny Southern accents (I LOVED that she said “flyers” for “flowers” and tried to work that into my own speech). She raised four children in a tiny house, one with special needs who was with her until he passed away not long ago. Without Uncle Terry and Pappaw around, her soul has been restless. I pray that she is with them now, peacefully cooking some delicious cornbread and planting some “flyers” in the garden. I love you, Granny.Jennifer, may God grant you His Peace, Comfort, and Strength to you and your family so that you may feel His love surround you all in your time of need. He is there for you, and you know this, so take a moment when you need and tell Him what you need. Colleen has a prayer request. Here is what she wrote:If I could have all Disney Fans Please send Prayers to me and my Family Our Gas was cut and we are trying our hardest to try and get it restored but it looks like it might take a few weeks to come up with the amount owed .So we untill then will be without hot water . Thanks Blessings to all. Please continue the prayers for Uncle Bob…we got some very distressing news today, and we are worried about how much more time we might have with him. Please pray for Cindy, all of her family, for his wife Clara, for Bob himself, for his kids, and everyone else that knows and loves him. He is a wonderful man, and I have been blessed to have gotten to know him. I have so many fond memories, he won’t ever be gone from our hearts, but his presence will definitely be missed.Thank you for your prayers for healing, and for your prayers for comfort, strength, and peace for all of the family. A second praise I have today — Cindy’s Uncle Ted has started his treatment for his cancer, and is doing well with it. I’m somewhat afraid, I’ll admit, about what turn his health may take when he hears about his brother Bob, but our prayers continue to go out to him to make sure the Lord hears us and lifts up Uncle Ted, Aunt Connie, and all of the rest of their family and friends at this time. Thank you for praying for him, please keep them coming! Also praise goes out to our friends Jennifer, her husband Grant, and their kids for coming up to our church to start attending services with us! My friends, the truths that we were reminded of yesterday are applicable every day. 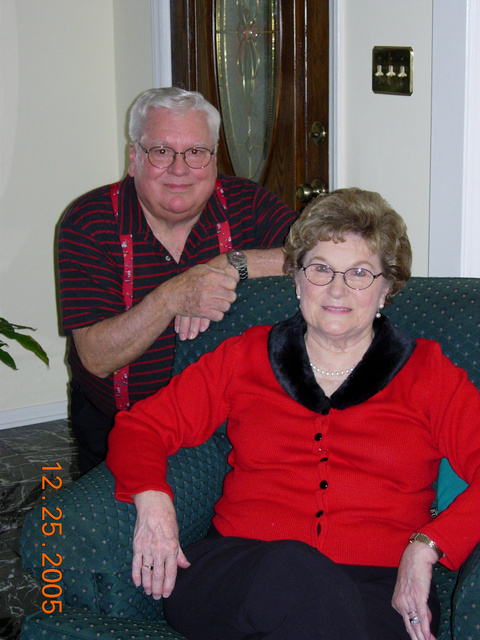 Mr. & Mrs. Millwood showed us how to love, and how to be strong in Christ. They have been blessed with longevity, but that isn’t always the case. Remember that every day is a gift, every day we have the opportunity to tell those we love that we love them, and that we should never forget that. Be in the Lord, and please, please, remember to love one another, as Christ loves us. May God keep you and Bless You, today and every day. Amen.